Having different wifi enabled devices such as your tablet, mobile device… but been unable to share a single data connection on them all simply because you don’t own a router or a MIFI can be pretty annoying. Considering the cost of subscribing of each device. 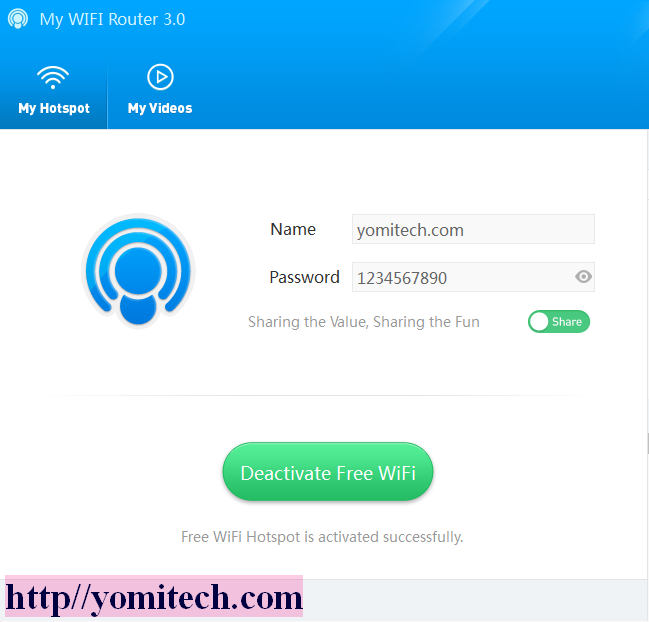 Today am going to be sharing with you four different applications that will allow you turn your pc to a Wi-Fi hotspot. All the programs am going to be sharing are all easy to use and don’t need any technical knowledge. All you have to do is to install the software, launch, input your username and password and connect. This is the most common and as far as I know it’s arguably the best software to use in creating a wifi hotspot on your pc. It’s easy to use and also easy to setup. The only con of this software is that it’s not totally free. The free version only comes with some limited features. And the pro version goes for around $35 for annual payment. Or you can just purchase a onetime license for $45. 1. It allows you to share 3g/4g network, Ethernet, LAN or even a wireless network. 2. It boosts your wifi range with its Virtual Router. 3. It also lets you personalize your wifi name. if you think connectify is overpriced or you just need something free then I will recommend this software for you. It’s also a very good software for creating hotspot on your pc. It also comes with some cool features. 1. It comes with firewall feature which you can use to restrict user’s access to specific servers. It’s also useful for preventing the use of some certain internet services. 2. It allows you to track all the visited URL by recording all sessions actions on your virtual hotspot. 3. You can also view all connected client’s device names, IP addresses and their MAC (Media Access Control) addresses. This is also another free software to create wifi hotspot. It’s very light, It is easy very easy to use with very few easy steps and it also comes with some cool features such as the block list. 1. It easy very light at just 1.08mb. 2. It is very easy to setup. Just name, password and click on activate. 3. It allows you to view and also manage all connected devices. 4. It also comes with blocklist feature to block some selected devices. 5. You can also limit the internet speed shared among users. 6. It allows you to extend your wifi range. 7. You can also share all kinds of internet connection such as 3g/4g, LAN or Ethernet. 2. It allows up to ten devices. 3. It allows you to set the maximum no of devices that can connect to your hotspot. 4. Acts as repeater. I.e. It extends your wifi range. 5. The application is very light at just 900kb. N.B: you can also create a wifi hotspot on a desktop pc, but you must have a wifi adapter card. I believe with all the softwares mentioned above, you are pretty spoiled for choice. But if you have any question or you face any difficulty using the softwares above. Drop your questions the comment box below and I will be glad to help.